When it comes to holiday decor, it is so easy to go overboard with the glitter and fluff. Not that there's anything wrong with that- I love me a good sparkly setting. Lately I've been into veering away from tradition. Practicing restraint in design is a good challenge. Our style is simple, modern, yet cozy. Discovering ways to decorate our home during this time of the year becomes tricky when almost everything out there seems to scream "more is more". I keep three things in mind when I'm pulling a look together - it always has to be 1. unique, and 2. easy, and 3. practical without sacrificing style. I aim for settings that don't require too much time or effort and can be repurposed throughout the year. My goal is always to evoke a mood through a mix of thoughtful details and unexpected elements. I put myself in the guests shoes and think....what will he or she be expecting at a Thanksgiving table? (Then I try to do exactly the opposite)....What will surely wow them or make them feel special? I maintain our simple aesthetic yet do something completely different each year, and this table is my favorite so far. I strayed from traditional elements like the maple leaves, pumpkins, and typical foliage. I wanted it to be clean, fresh, organic yet still inviting. When you think modern, it can give off a stark cold vibe. To warm things up and add a hint of the fall season I used a variety of textures and organic elements mixed with a touch of gold (just enough to add some holiday sparkle). 1. I always aim to keep things practical and budget-friendly by incorporating affordable pieces from thrift stores like the simple matte stoneware plates and woven chargers. The gold flatware was my tabletop investment last year. I got them on sale from West Elm - they're great for everyday use but totally dress up any table. They're like the LBD of flatware! 2. 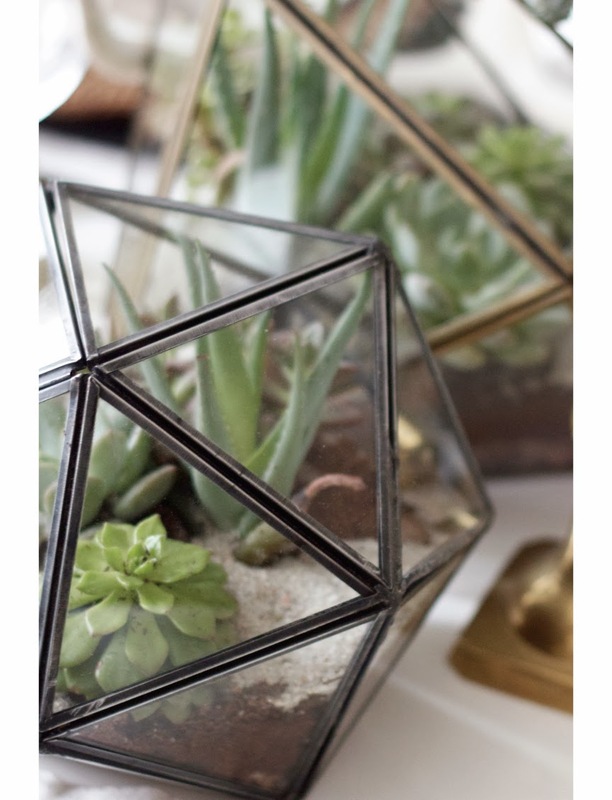 Sculptural geometric vases topped off with air plants and glass terrariums filled with succulents lend a fresh take on traditional floral decor - and not to mention can be re-used all year round. They are extremely budget and environmentally friendly and would make great favors for your guests. I also added a vase filled with eucalyptus pods - our place smells soooo good. No flowers you ask? I decided they tend to add a lot of fluff and sticking to botanicals was better for the look I wanted to achieve. 3. The deer antler is the perfect example of sustainable decor (they naturally shed and no animals are harmed in the process). It adds organic movement, shape and a bit of drama. 4. The table runners were a Homegoods find. I like the idea of not covering up the entire table with a table cloth - makes things feel less formal. 5.To play up the cozy feel of our dining area, I added large throw pillows on our banquette and a sheepskin throw on a couple of chairs. 6. 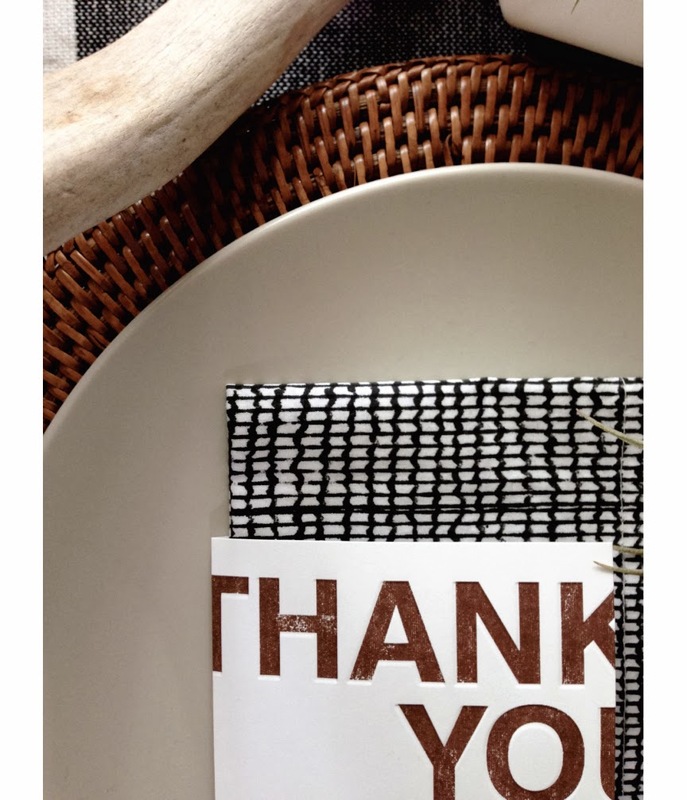 Instead of place cards, and to add a graphic punch to the setting, I used simple letter press "thank you" cards I had stashed in my stationery box. Slipped the napkins inside them and topped the setting off with an air plant. I plan on writing a special note inside for each guest. Simple yet makes a thoughtful statement. 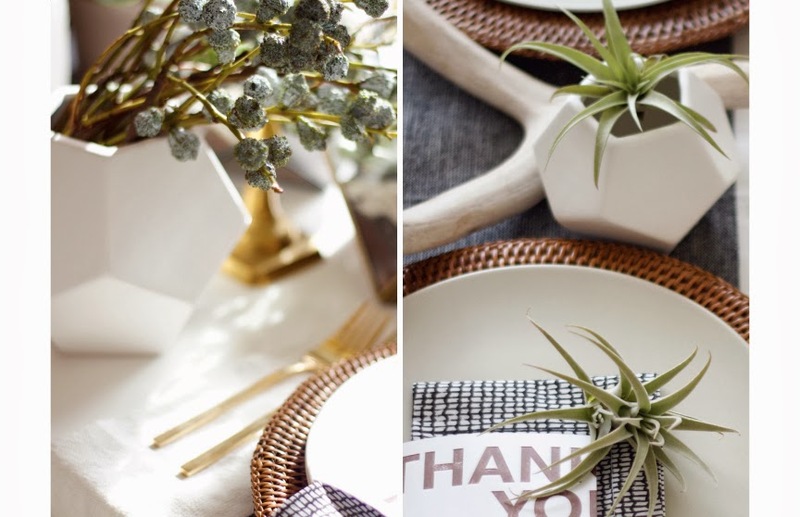 This one detail totally transforms the table. 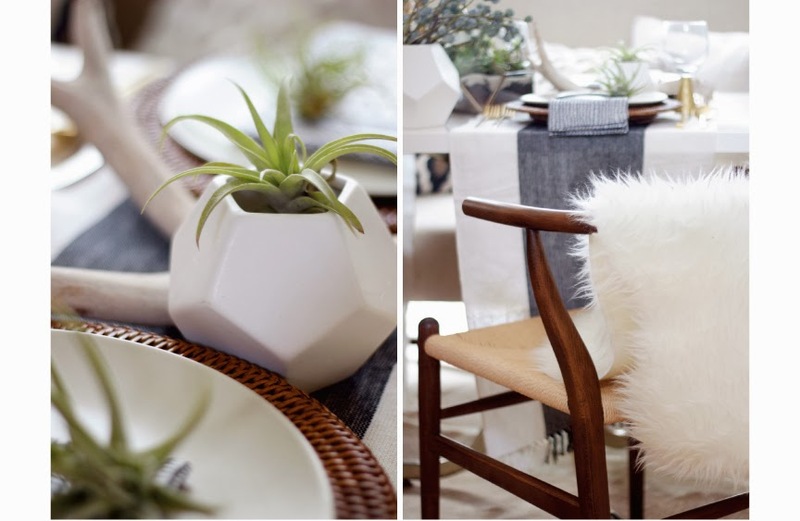 To make this whole set-up even more practical, I'll be re-styling this same table for our Christmas gathering. I enjoy making our holiday decor for both Thanksgiving and Christmas cohesive each year. I'll simply switch out a few elements and add some festive accents. Repurposing vintage and recycled goods is my favorite way of adding character. I like mixing up our family heirlooms, hand-me-downs, and thrifted knick knacks with my own more modern pieces. 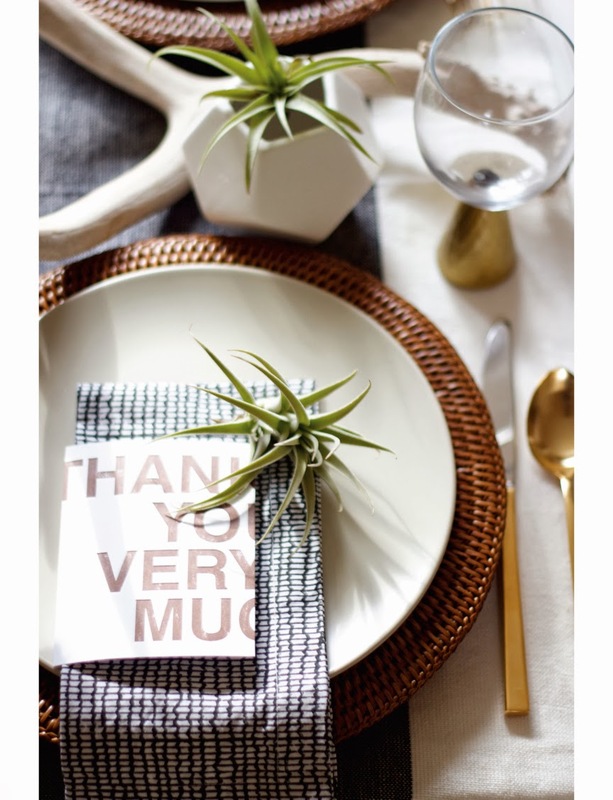 There's no need to have a ton of decor on hand or to buy all-new items to create table settings for each occasion. A few details here and there can turn a whole look around. 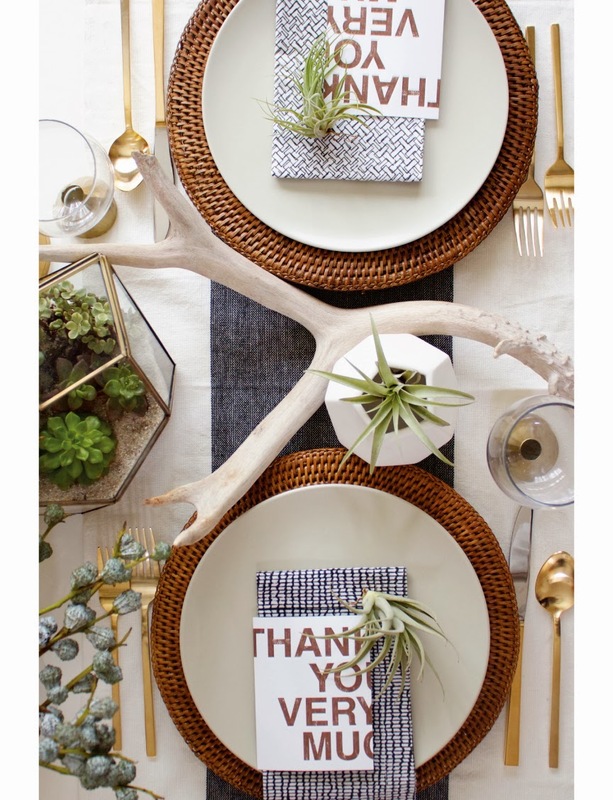 I hope this inspires you to create your own simple, crafty yet sophisticated table for the upcoming holidays! Thanks for dropping by.